Despite crushing Australia, France won’t be taking Argentina for granted. 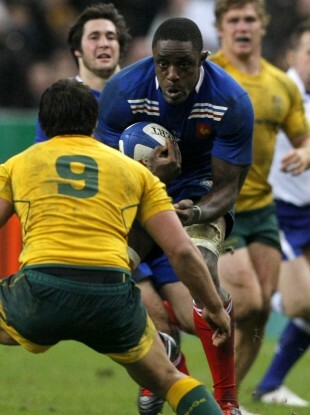 Yannick Nyanga of France charges at Australia's Nick Phipps last weekend. FOLLOWING THEIR IMPRESSIVE 33-6 demolition of Australia on Saturday, France are primed for yet another tough encounter with in-form Argentina. France kept Australia try-less at the Stade de France as they claimed their first win over the Wallabies since 2005. Next up for the French is a clash against Argentina, who have won eight of the past 12 meetings between the two nations, but flanker Yannick Nyanga fancies his side’s chances. “Personally I think Argentina are better than Australia right now.” he said. “Obviously they had no results during the Four Nations compared to Australia, but actually I see very few teams able to go to Wales like that and score 30 points without nothing to say, all in control. “They did not score their tries on interceptions or fallen balls by Welsh players, it was really some build tries. “It was a very logical victory, so considering the previous games we played against Argentina, we can think Argentina are favourites for this game, but remember Australia were favorites too. Meanwhile, forwards coach Yannick Bru wants his players to maintain the confidence and motivation gained from victory over Australia, although he feels there is still a lot to improve on. “We will try to keep the same motivation than against Australia,” Bru said. “Don’t lose a yard on the pitch, try to dominate the lines, and obviously we’ll try to keep the same solidity on the bases. “If we can do that, I think we really are relaxed before this game. Saying that, everything was not perfect against Australia, we have some things to improve. Email “France wary of Argentina threat”. Feedback on “France wary of Argentina threat”.